At a glance, Wisconsin's legislative district maps in place since 2011 don't reveal districts with the bizarre shapes and outlines that are classic markers of gerrymandering schemes. 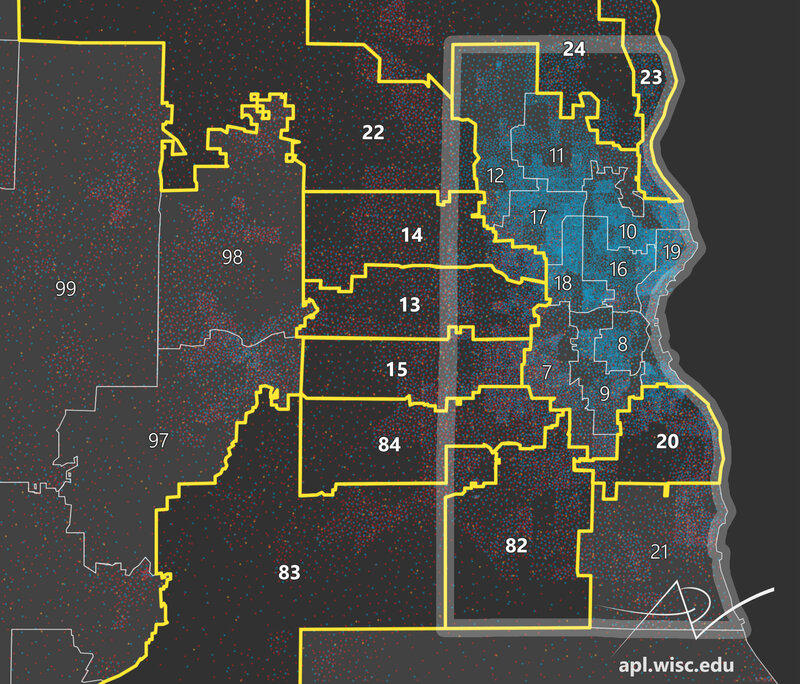 But a closer examination of the state Assembly districts reveals a more sophisticated approach to this electoral stratagem, particularly in the sharp red-blue divide that spans Milwaukee and its suburbs. Gerrymandering is the practice of intentionally manipulating the boundaries of legislative districts to achieve a desired political end. Given the increasingly partisan voting practices of elected officials in Wisconsin and more broadly across the United States, manipulation of districts to give one political party an advantage leaves voters who support other parties' candidates without meaningful representation, depriving them of a voice in representative government. Claims of unconstitutional gerrymandering in Wisconsin is at the heart of an historic lawsuit before the U.S. Supreme Court. The plaintiffs in Gill v. Whitford, which was argued before the high court on Oct. 3, 2017, contend that the state's legislative district map adopted in 2011 exemplifies partisan gerrymandering that deprives them of their rights to representation under the legal concept of "one person, one vote" and is therefore unconstitutional. Every ten years, as mandated by the U.S. Constitution, a complete count of all the people in the nation is taken. The most basic goal of the decennial count by the U.S. Census Bureau is to update the government's information on the number of people living at every address around the country. These counts are used for a number of purposes, including setting state and local funding levels, and planning public works investments. Primary among the Census' purposes is to maintain equal representation at all levels of government. Over time, some places grow in population, while others shrink. The Census data are used as the fundamental building block for redrawing political districts every decade to ensure that each person is equally represented in government. 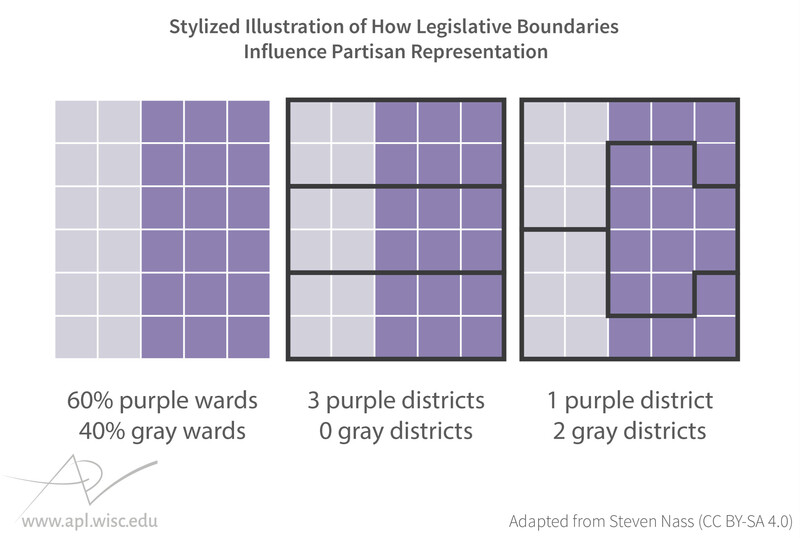 The redistricting process varies by state, and there can be significant differences between them. In Wisconsin, as in 36 other states, the state legislature has control of the process. The district map is revised following the release of Census population counts, and the revised map is is considered and voted upon like any other legislation, requiring a majority vote in both legislative chambers and the governor's signature. Thus, if a political party holds power in the year following the decennial census, it controls the effort to redraw legislative boundaries. Following the 2010 election — and that year's Census — Republicans held majorities in the Wisconsin Assembly and Senate, as well as the governorship, putting them in the driver's seat to control that round of redistricting. 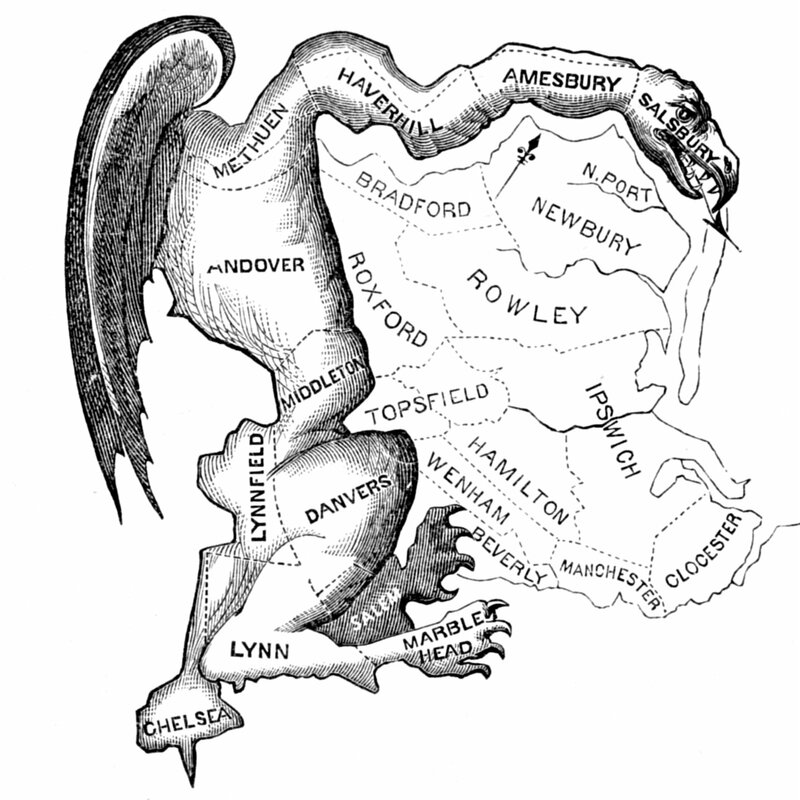 The term "gerrymandering" was coined in 1812, following the creation of a legislative district resembling a mythological salamander under Massachusetts Gov. Elbridge Gerry. A compactness rule also exists in Pennsylvania, and was at the forefront in February 2018, when that state's Supreme Court decided on a lawsuit arguing that its 2011 legislative maps were a partisan gerrymander. For example, Pennsylvania's 7th congressional district, often described as a silhouette of Goofy kicking Donald Duck, received attention as an egregious example of where the compactness rule has been violated. The state high court overturned the 2011 district map, ruling that it was indeed a partisan gerrymander, in part based on violation of the compactness rule, and ordered the drawing of new districts. Pennsylvania's 7th congressional district adopted in 2011 didn't follow standards related to the compactness rule, and was determined by that state's Supreme Court in February 2018 to be an unconstitutional example of gerrymandering. The state constitution specifies three additional requirements that are intended to keep communities together in terms of representation in government. It states specifically that districts should maintain the integrity of communities of interest — usually defined simply as groups of people who have similar legislative concerns — and requires that districts be bounded by county, precinct, town or ward lines. Finally, each district must be contiguous — that is, its parts must be attached to one another. Some exceptions to the contiguity rule apply. For example, the city of Racine has a non-contiguous area due to a 1964 annexation of land from the town of Mount Pleasant; it's separated from the rest of the city area by the Root River and unincorporated areas. 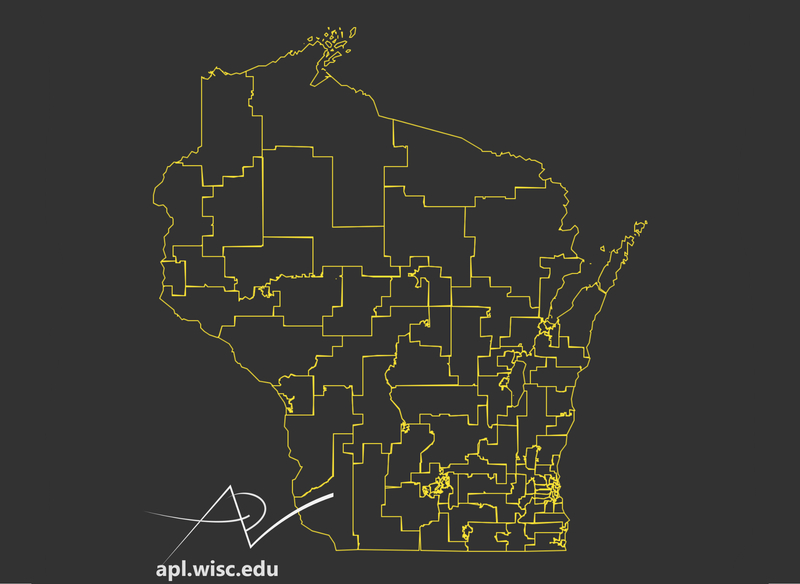 In such cases, Wisconsin's rules allow a legislative district to follow another administrative boundary, even if it is non-contiguous, in order to preserve the community's representation by a single elected official. Likewise, Washington Island at the tip of the Door County peninsula is included in the district that covers the peninsula across the Porte de Morts passage. Packing refers to the practice of drawing particular districts in such a way as to ensure that another party's candidate wins that seat by a tremendous margin. Although the opposing party is all but guaranteed the seat, packing makes surrounding districts less competitive, and thus tips the balance of power in the legislative body overall toward the ruling party. 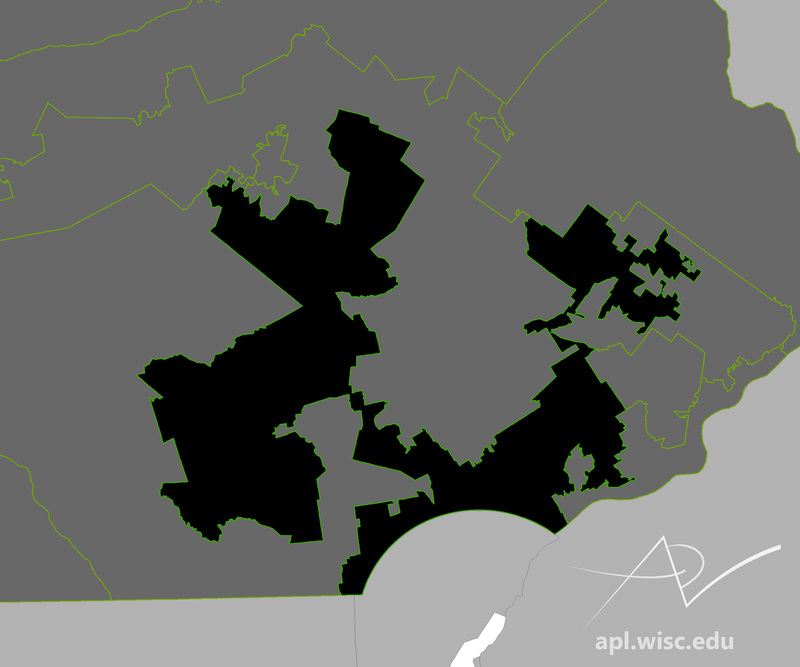 The Wisconsin Assembly district map adopted in 2011 by the state's Republican-majority Legislature does not jump out as an example of gerrymandering that's visually distinctive in terms of convoluted and strangely-shaped districts, such as those struck down in Pennsylvania. Instances of both packing and cracking can be observed though. Wisconsin Assembly districts were revised in 2011 following the 2010 Census. The outlines of the Wisconsin Assembly map adopted in 2011 illustrate how Democratic votes in the 2016 presidential election, centered in the city of Milwaukee, are distributed among the legislative districts. The outlines of the Wisconsin Assembly map adopted in 2001 illustrate how Democratic votes in the 2016 presidential election, centered in the city of Milwaukee, could be distributed among the legislative districts. 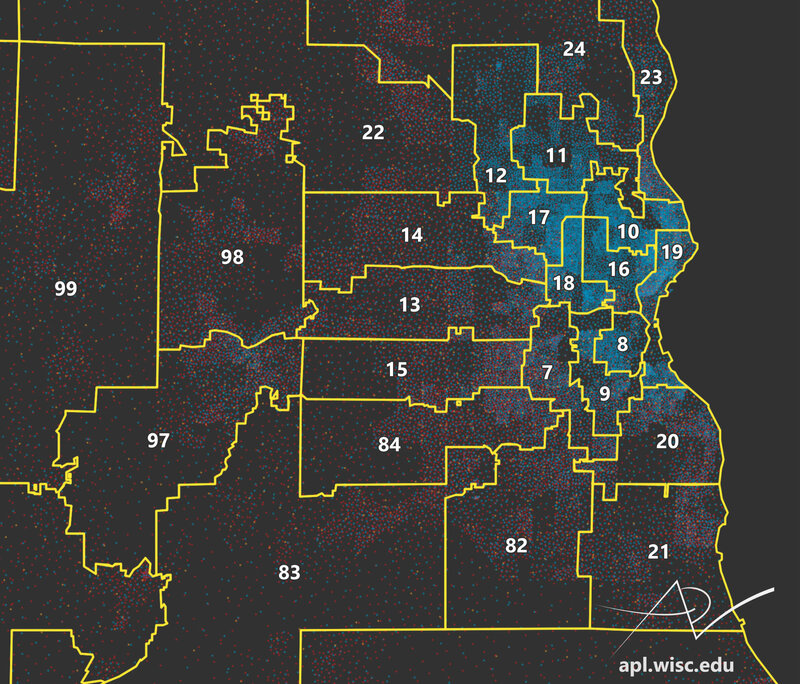 The 2011 Wisconsin Assembly districts surrounding Milwaukee show evidence of cracking, one method of electoral gerrymandering. How different is the 2011 map from the previous set of legislative districts? 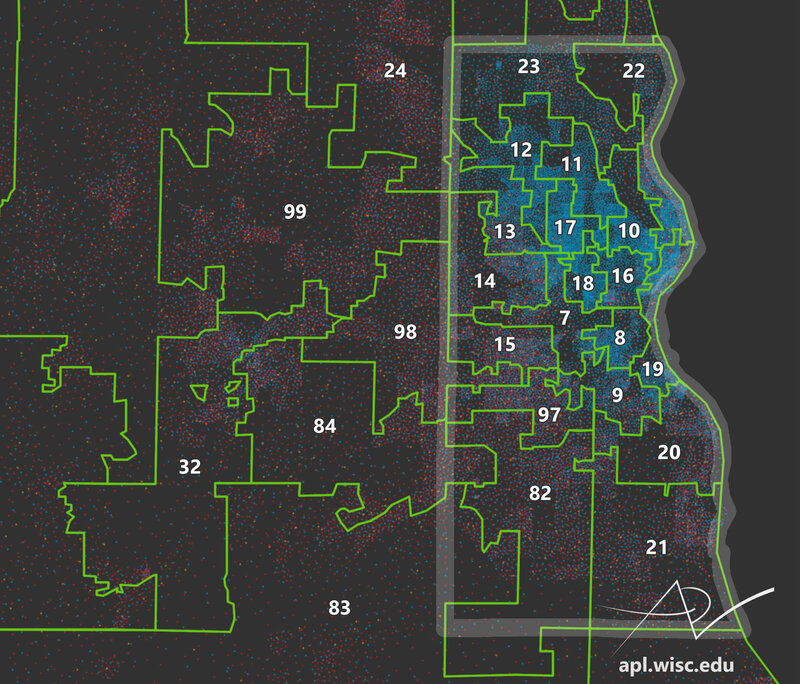 The 2001 map reveals a radically different political geography in the Milwaukee suburbs. It is so different from a geographic perspective that it’s not possible to directly compare districts according to their numbers and say definitively whether a seat "flipped" following the redistricting process. The most notable difference is that in 2001, districts were by and large drawn to respect the Milwaukee County boundary, the vertical line that runs down most of the center of this map view. The 2001 Wisconsin Assembly districts in the Milwaukee metro area mostly followed the Milwaukee County boundary. The creators of the 2011 districts didn't follow the state constitution's directive that legislative districts should respect county boundaries whenever possible, and created a map that cracked the central and near-suburb bloc of Democratic voters across many districts that reach into the far-flung and deeply conservative suburbs of neighboring Waukesha, Ozaukee and Washington counties. 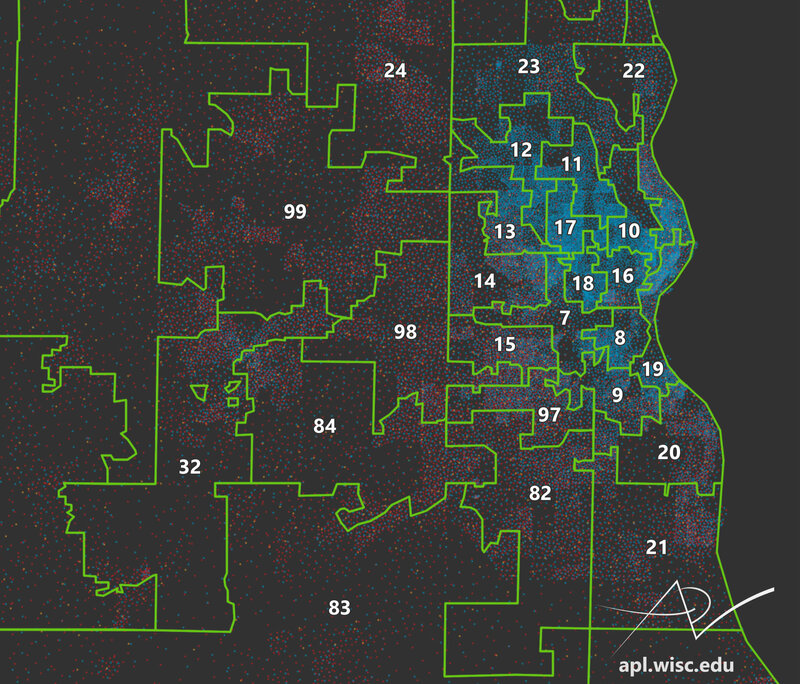 These suburbanized areas are populated in large part by affluent, white conservative voters. In the era of white flight, whites left Milwaukee, city and county, in favor of neighboring counties. The historical suburbanization process itself led to counties with very different political profiles. Given the state constitution's requirement that districts preserve communities of interest, Assembly members who represent constituents across a county boundary are potentially problematic. In November 2016, a three-judge federal court ruled that Wisconsin's 2011 state Assembly district map constitutes a partisan gerrymander. The U.S. District Court for the Western District of Wisconsin found that the map's overall effect is to tip the balance of power toward Republican candidates, helping to ensure the party's control of the upper and lower houses of the state Legislature. In addition, the demographic patterning of the districts suggests that the 2011 map is inconsistent with a basic premise of representative government — to allow communities of interest to be represented by an official they elect. The cracking present in the districts of the Milwaukee suburbs is perhaps the strongest example of this force in action. The U.S. Supreme Court is issuing its ruling on the case in June 2018.